Baseball and the Star-Spangled Banner go way back. Back to the nineteenth century, and long before the Star-Spangled Banner became America’s National Anthem. I don’t think it is a stretch of history to suggest that the popularity of playing the Star-Spangled Banner at baseball games contributed significantly to it becoming the National Anthem. 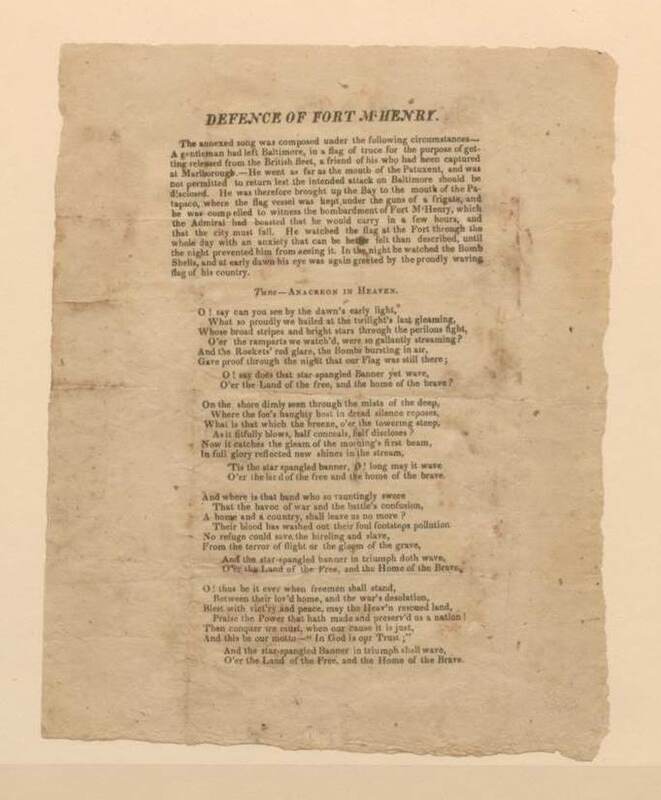 Within days of writing the Defence of Fort McHenry, Francis Scott Key’s words were printed on a broadside and distributed in Baltimore. Shortly thereafter, the words and music were published together, because Key wrote the words to fit the tune of “To Anacreon in Heaven,” which was a popular song at the time. It wasn’t the first time that Key had composed words for the same tune. The Star-Spangled Banner rapidly grew in popularity and was frequently played at large gatherings throughout the country, but especially before baseball games. In 1889, the Secretary of the Navy ordered that the Star-Spangled Banner be played when the flag was raised, and by 1916, President Woodrow Wilson used an executive order making it the National Anthem. Congress eventually wrote the legislation and President Herbert Hoover signed it into law March 3, 1931. Those events, and the long-standing tradition of playing the National Anthem at baseball games and other sporting events brings us to this question, which I received yesterday at The Daily Flag News. We play youth baseball in a complex with 4 baseball fields, a couple football fields and at least one soccer field. Are players and others present required to respond to each fields’ playing of the National Anthem with different starting times? Those who wrote the National Anthem Code could not have foreseen a circumstance such as this. The Code does not tell us when, or where, or how to perform the National Anthem, only how to behave during the Anthem. Figuring out the logical, appropriate etiquette for various situations turns into a flow chart of sorts, and after ten years reading and writing about the protocol, I am confident in my response. Thus if you have observed the protocol and etiquette for your immediate circumstance (your game): you have stood at attention, saluted as appropriate to who you are, listened to and/or sung the National Anthem—then you have met the honor, and obligation attendant to your game. It is not necessary for you to stop your game when a new game and Anthem begins on another field within your hearing. In baseball (in general) any player, coach or manager can ask for a time out, but only the umpire can grant time out. By the time the umpire could call time out, the Anthem—which runs for about 70 seconds—would be over, and for players to just stop playing without a time out could be dangerous and chaotic. It’s the sort of problem that must give coaches and umpires a headache and heartburn, too. Because this situation must be a recurring problem, I suggest that the various organizations, plus umpires and referees that meet and play on these game fields have a meeting to establish a standard protocol and etiquette for observing the National Anthem on these fields. It would would simplify things so much, and insure that each game was conducted properly, and that honors to the National Anthem were properly given. This is an amazing opportunity to teach young people about the history of the Star-Spangled Banner, why we honor the flag by standing and saluting, and how it ties into the history of baseball. Without baseball, it might have taken a lot longer for the Star-Spangled Banner to become our National Anthem. PLAY BALL! Yes, the 2007 season is underway and I am thrilled. Deborah and I love baseball, and as a form of entertainment, we are (generally) positive that no one will be shot, stabbed, murdered, raped, autopsied, etc. during the course of the few hours of pleasure. Good, clean, wholesome fun. And Deborah’s favorite color is Astros Red. It’s time for giant flags unfurled across the outfield, emotional first-pitch ceremonies, deafening fly-overs from local military bases, player introductions, moments of silence, an American Idol finalist and a country star belting out a national anthem, April reaquaintance from coast to coast, and most of all a lot of workers calling in sick and hopefully not bringing the economy to a halt. Opening Day is here, and it already has been ushered in by the unfurling of a world championship banner in St. Louis on Sunday night, followed by some 6-1 payback by Tom Glavine and the Mets over the Cardinals. I admit to knowing nothing about India’s navy, but I liked the picture of the naval cadet pinning a flag onto the Governor’s chest. Apparently there are celebrations planned all week for Merchant Navy Flag Day. CHENNAI : The Merchant Navy’s Flag Day celebrations were inaugurated by Tamil Nadu Governor Surjit Singh Barnala on Monday. A Merchant Navy cadet pinned the national flag on the Governor’s tunic at a brief function held at the Raj Bhavan. Mr. Barnala wished the very best in the endeavours of the Merchant Navy and to its cadets. Seafarers vice-chairman Capt. K. Vivekanand said the national flag pinning ceremony was part of the weeklong national maritime celebrations to help create greater awareness among the public about national maritime day. Cultural programmes and blood donation camps would be some of the other components of the celebrations. Indiana residents are again voting on new license plates for their automobiles. The options this year all play on a State flag theme, utilizing the elements in different ways. Make sure to go vote. INDIANAPOLIS — Design options for Indiana’s new standard license plate all have a state flag theme and a spot for new stickers identifying the car’s home county as the Bureau of Motor Vehicles hopes to drop its decades-old numbering system. The public can begin voting today for its pick among four designs for the plates that will be distributed to motorists next year. The new plates will replace those issued in 2003 that are green-blue pastel with a farm landscape. The four designs include two with close-ups on portions of the state flag’s torch and stars, and another with the state seal to one side and a state flag image in the background. BMV Commissioner Ron Stiver said Monday the four finalists were picked from more than 40 proposals submitted by colleges, design agencies and state departments.